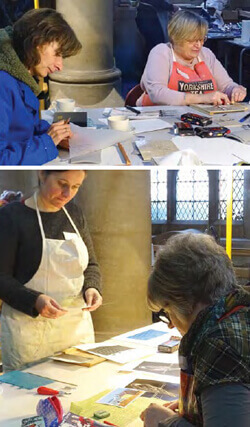 "It all happened when eight members of Pershore Arts spent a happy January day trying out different printing methods, including linocuts and collagraphs, at St Peter's Church in Malvern" says Chris Dodd. "Aimed at complete printmaking beginners like me, it was a great workshop which turned out to be less difficult than I though it might be. Thanks to the expert tuition and encouragement of Andrew Judd and other members of St Peter's Printmakers, I produce mu first ever lino-cut (see below) and was surprisingly pleased at the result. As I was hacking away with the cutters I didn't really expect my zebra to turn out so zebra-like! I don't know what my fellow members felt, but personally I'm hooked. One zebra might well lead to a whole menagerie!"